Even in the colder months, Lake George is packed full of activities and adventures the whole family will enjoy. Below, we've put together a helpful list of popular things to do in the Lake George area so you can start planning a fun-filled and memorable winter vacation. The highlight of the winter season in Lake George Village is the Lake George Winter Carnival, which takes place each weekend throughout the month of February. 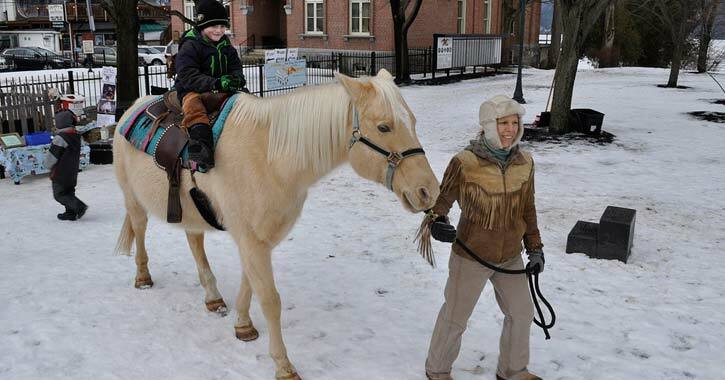 During this winter celebration, there are always plenty of exciting activities for the whole family to enjoy. Best of all, it's free to attend! Wondering what the Lake George area has to offer skiers and snowboarders who are interested in visiting? There are a few great ski resorts not too far from Lake George that are perfect for people of all skill levels. Wear your best outdoor winter clothes and head out to the local slopes. Sliding down a snowy hill is a joy you never outgrow, and there are multiple spots in the Lake George area where you can go sledding or snow tubing in winter. One of the most popular choices is the Lake George Rec Center's Tubing Hill, which features free admission. However, West Mountain and Tubby Tubes offer paid snow tubing parks where you don't need to bring your own tubes. Lake George is usually frozen solid by mid-January, providing the perfect rink for ice skating each winter. However, if the lake isn't frozen during your trip to the Lake George area, there are other local sites that offer public indoor or outdoor ice skating. If the ice is safe, then gear up and head out onto a frozen lake for a day of ice fishing. Although some fishermen go alone, it can be fun to bring the kids, set up a shelter on the lake, and ice fish together. Don't forget to take hot chocolate with you! This is an activity you can do for free on Lake George when the lake is frozen, but if you aren't an experienced ice fisherman, you can hire a guide for safety tips and expert knowledge of the lake. If the lake's not frozen, check out these other popular fishing spots in the Adirondacks.